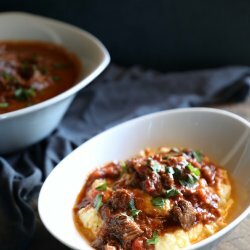 An easy and delicious keto short rib ragu (or sauce) that is delicious served over zoodles, spaghetti squash, keto gnocchi and keto friendly polenta! Can also be served over regular pasta for your non-keto peeps. Whole 30 and SCKC friendly by replacing the wine with chicken broth. Heat the oil in the Instant Pot insert using the saute function. Add the bacon, onion and garlic and cook for 2 minutes, or until fragrant. Add the short ribs, parsley, salt and pepper and cook, stirring occasionally, until the outsides have browned, about 5 minutes. Add the wine (or broth if using) and entire can of tomatoes, to the pan. Set the Instant Pot to MANUAL / HIGH PRESSURE / 60 MINUTES. After cooking us done, use quick release to vent. Remove the lid and use a slotted spoon to transfer bones and meat into a separate bowl. Remove the bones and any connective tissue and discard. Return the meat back to the sauce and stir. Taste and season with additional salt if desired. Serve hot over zucchini noodles, spaghetti squash, keto gnocchi, or cauliflower polenta. Heat the oil in a large, heavy bottomed pot over medium heat. Add the wine and entire can of tomatoes, to the pan. Cover and simmer on low heat for 2 – 3 hours, or until the meat is tender and falling apart. Store leftovers in an airtight container in the refrigerator for up to one week, or in the freezer for up to 3 months. Approximate total net carbs per serving = 4g.